Some 30,000 Iraqi troops and militia backed by aircraft pounded militant positions in and around Tikrit on Monday in the biggest offensive yet to retake one of the Islamic State group's main strongholds. Government forces have been working their way north in recent months, notching up key victories against IS but Tikrit, which has resisted them several times, is their toughest target yet. Building on recent successes, commanders voiced hope that the broadest operation since IS overran swathes of the country last June would be a step towards the liberation of Mosul, the militants' main hub in Iraq. "Security forces are advancing on three main fronts towards Tikrit, Ad-Dawr (to the south) and Al-Alam (to the north)," a senior army officer on the ground told AFP by telephone. The operation began in early morning after being announced by Prime Minister Haider al-Abadi the previous evening. The army officer said the forces involved in the battle were from the army, police, counter-terrorism units, a government-controlled volunteer group known as the Popular Mobilisation units and local Sunni tribes opposed to IS. "The attack is being carried out using fighter jets, helicopters and artillery targeting Tikrit to secure the advance and cut supply routes," he said. Military sources said Iraqi warplanes were involved but it was not immediately clear whether foreign air support -- Iranian or from the US-led coalition fighting IS -- was also called in. According to both Iraqi and Iranian media, Qassem Soleimani -- the commander of the Al-Qods Force covert operations unit of Tehran's elite Revolutionary Guards -- was in Salaheddin province to help coordinate operations. Abadi urged the security forces on Sunday to spare civilians during the offensive. Speaking from Samarra, the other main city in Salaheddin province, he appeared to be addressing fears of reprisals against the Tikrit area's Sunni population. "The priority we gave to the armed forces and all the forces taking part alongside them is to preserve the security of citizens," he told reporters. On social media, he called "for utmost care in protecting civilian lives and property." Hadi al-Ameri, the Popular Mobilisation commander and a central figure in Iraq's fightback against IS, appealed to Tikrit residents on Saturday to leave their homes within 48 hours so government forces could "wrap up the battle of the revenge for Speicher." Speicher is a military base near Tikrit from which hundreds of new, mostly Shia, recruits were kidnapped before being executed in the early days of the IS offensive that swept through much of the Sunni Arab heartland north and west of Baghdad last June. Shia militias in particular have vowed to avenge the Speicher executions, sparking fears of mass killings against Sunnis if Tikrit were to be recaptured. 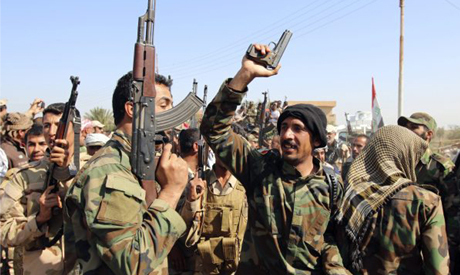 Some Sunni tribes in the Tikrit area have been accused of direct involvement in the Speicher massacre. Abadi appealed to residents to turn against the militants, who have suffered a string of military losses since Iraq's foreign partners stepped up their support. "I call on all those who were misled and made mistakes in the past to lay down their arms today. This may be the last chance," Abadi said, suggesting some could be granted amnesty. Iraqi forces tried and failed several times to wrest back Tikrit, a Sunni Arab city on the Tigris river around 160 kilometres (100 miles) north of Baghdad. The military commander for Salaheddin province, Abdel Wahab Saadi, said Tikrit had both symbolic and strategic importance. "The aim of course is to liberate Salaheddin to allow for the return of displaced families but it is also going to be a stepping stone on the way to liberating Mosul," he told AFP. Tikrit is the hometown of executed dictator Saddam Hussein, the remnants of whose Baath party have collaborated with IS in attempting to topple the Shia-dominated government. IS declared a "caliphate" last June straddling Iraq and Syria, where the US-led coalition has also been conducting air strikes but not coordinating with any significant ground force. A senior US senator said on Sunday that US forces were specifically targeting Mohammed Emwazi, the London man dubbed "Jihadi John" believed responsible for videotaped executions of several US and other Western hostages. "Oh, yes. He's a target. There should be no question about that," former Senate Intelligence Committee chair Dianne Feinstein told CBS television's "Face the Nation." UN efforts to stop the violence that has pitted Bashar al-Assad's regime against an array of rival rebel groups for almost four years suffered a blow on Sunday. Rebel forces battling government troops in the divided second city of Aleppo rejected a plan drawn up by UN envoy Staffan de Mistura for a freeze in fighting and demanded a comprehensive solution to the conflict.